Mr G from Arnold, Nottingham saw our advert in the local NG5 Magazine and called us to obtain a quotation to fit Solar panels to his South West facing roof. 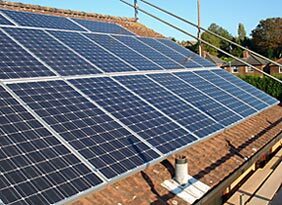 After accepting the quote we fitted a 3.99kWp system in September 2011. He started receiving the Government Feed In Tariff (FIT) at a rate of 43.3p/kWh for the generation tariff and 3p/kWh for the export tariff, deem 50% of the amount of electricity generated for domestic properties. The payback calculation for this system gives an approximate generation annual income of £1,419.37 for the first year. The system gives a total income and savings of approximately £1,698.00. He will receive guaranteed payments from the Government FIT scheme for 25 years, plus they will be adjusted for inflation using the Retail Price Index. Over the next 25 years Mr G can expect combined income and savings of around £52,000. The installation is a faily simply process and this particular installation was completed within 2 days with minimul fuss and disruption to the customer. As you will see from the photographs, the arrangment of the solar panels were both portrait and landscape to allow the most amount of panels to be fitted, in order to receive the most benefits from the system.